After 12 months of searching I have finally managed to get a hold of a pair of Merrell Moab FST Men’s Shoes to try them out. Supposedly the average men’s shoe size is 10.5 US which is why as someone who wears size 14 US it has taken me so long to track down a pair. I try to support local stores but when all else fails, Amazon becomes my friend. As someone with large feet my choice of shoes for hiking is very limited, an issue that I contend with in every sporting or recreational activity in which I have participated. What this means is that I don’t have the luxury of choice and have to work with a very limited range. This is why whenever a manufacturer comes out with a pair of shoes in my size I will purchase a pair to see how they perform, whatever the perceived shortcomings. I have previously tried a pair of Merrell Moab Ventilators, a well known model and one of the most used shoes by American thru-hikers. My issue with the Ventilators is while they are durable and perform well on wet muddy trails but don’t have good traction on the dry powdery trails which makes up much of my hiking. Based on my experience with the Ventilators I had preconceived ideas regarding the Moab FSTs. 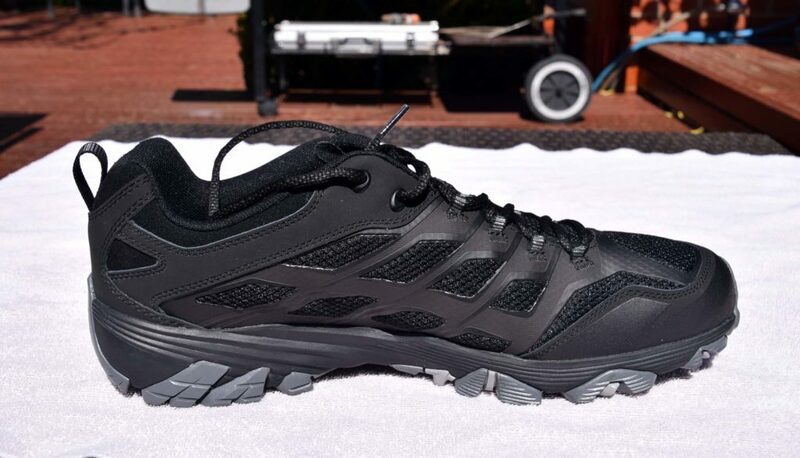 These shoes fall into the trail runner/hiking shoe category and won’t provide the durability and support of a full leather boot. They will however provide a lightweight alternative for those of us that prefer not to wear boots. I’ve been using the Moab FSTs for just over two weeks now so thought I would provide a brief overview on how they have performed so far in this limited timeframe. It’s now been two months since I published my first impressions of these shoes and I have worn them almost exclusively apart from the odd times I have done comparisons with other footwear. In that time they have notched up over 600km in a variety of conditions. So how did they perform? I wear a size 14US hiking shoe and struggle to find a good range of footwear to choose from. This small range is even smaller in Australia with importers electing to stop their range just below my size and as such I find myself buying from Amazon in the USA . For the past two years I have been testing whatever I can find in my size to find that ‘perfect shoe’ and for me nothing has managed to come close to the Salomon XA 3D Pro. The Solomons have ticked just about all the boxes but still didn’t quite reach that lofty goal of perfect. In testing the Merrell Moab FST shoes I had preconceptions about how they would perform based on my experience with the well known Merrell Moab Ventilators which are one of the best known hiking shoes currently on the market; this preconception was a negative one. However having worn the FST’s for just over three months in a variety of conditions this offering from Merrell was a big surprise, a very big surprise. As I mentioned in my first impression review at the time I managed to purchase my Merrell Moab FST’s I couldn’t find a pair fo sale in size 14 on the Australian market so had to purchase mine from Amazon in the USA. The stock insole that comes with these shoes is not particularly good and needs to be replaced straight out of the box. There just isn’t enough cushioning which is why I swapped these out for blue Superfeet. This combination works well for my foot and arch type. Colour! Now I know I’m being picky but in my size I pretty much have one colour option and that’s black. I just find that black shoes show the dirt to easily. They aren’t waterproof. Take this how you will but I wouldn’t wear these in snow or conditions that are permanently wet or boggy. They do produce a waterproof version and if this is the type of conditions that you usually hike in then look at those. The fit on this shoe is the best that I have ever had on a hiking shoe. This fit is mainly due to a combination of length, width and depth and also included the insole choice. Fit is going to be specific to each hiker but these shoes are in the ‘Goldilocks’ zone for me. The sole on these shoe is robust and bulletproof. It takes just about any surface type you can throw at it providing ample foot protection and kept on going. 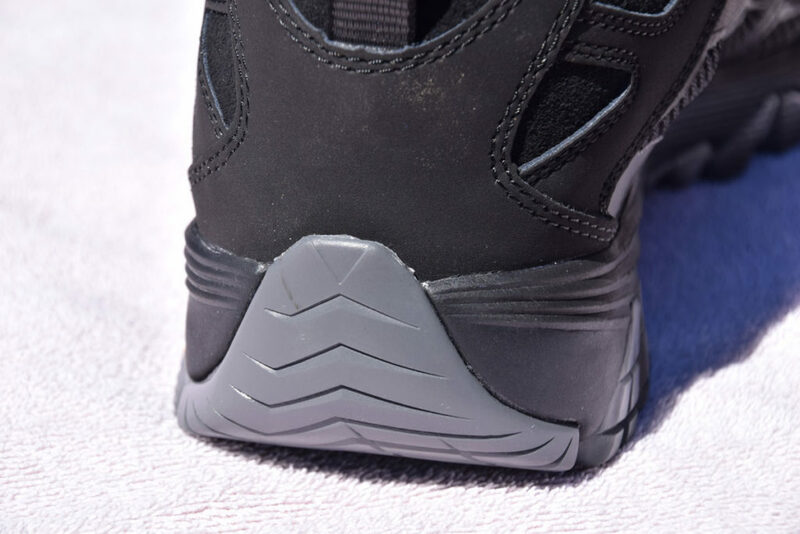 Even though the FST’s come from the same manufacturer that produces the Moab ventilators the tread pattern is different enough that it has good grip on dry powered conditions which is a failing with the Ventilators. they also handle the wet as well. Th FST’s are a lighter weight hiking shoe from Merrell for those that travel fast and light. 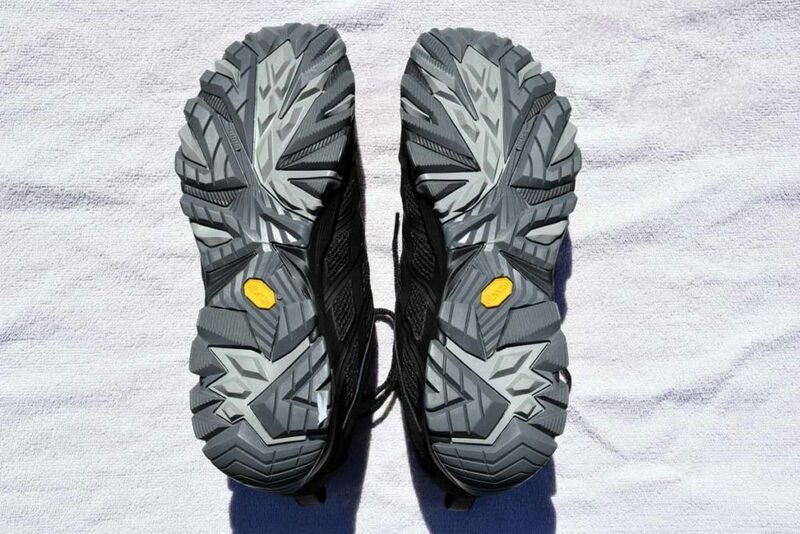 I wear these on concrete and bitumen as well as on the trail and they work well. They breathe which means that you don’t build up heat in the hotter months and when thy get wet on water crossings they dry quickly. In choosing footwear there are a number of considerations with the obvious one being size. When you go into most specialist hiking stores they will usually have small ramps to try out different shoes to make sure that you aren’t pushing into the toe box. While length is just one aspect of size and while reasonably critical, width and ‘depth’ are also just as important. I have also worn the Keen Targhee II’s and if you have a broad solid foot then this is a good starting point. If you have a slightly wide and solid foot then go the Salomon XA 3D Pro’s. If however you have a long average width and average hight foot then this is where the the Merrell FST’s come into there own. Now I need to say here that everyones foot is different so what works for one person won’t necessarily work for others. I have been very happy with these shoes and have now worn these shoes out managing over 100km in variety of conditions. While the testing still goes on the Merrell FST’s are a strong contender for my planned thru-hike in 2018. They have a good solid sole that provides good traction in dry conditions, as well as good grip in the wet. Please note that the full range of models/colours of these shoes doesn’t appear to be available in Australia but is available in the USA.